The Mount Shasta area is blessed with an overabundance of great hiking options, both on Mount Shasta itself and in the mountains and river canyons that immediately surround it. Many may not feel the need to venture beyond this amazingly beautiful area and it is easy to understand why. However, for those with the bug to explore a little further there are several incredible mountain ranges just outside Mount Shasta’s vicinity. The largest and most spectacular of these other ranges are the Trinity Alps. Soaring granite towers, clear lakes, roaring rivers and massive waterfalls are all found in a vast wilderness that exceeds 500,000 acres. Indeed, by most standards, this is Northstate’s premier wilderness area. No other mountain region in California, north of the Sierra Nevada, offers the chance to disappear for weeks on end without retracing steps and covering the same ground. 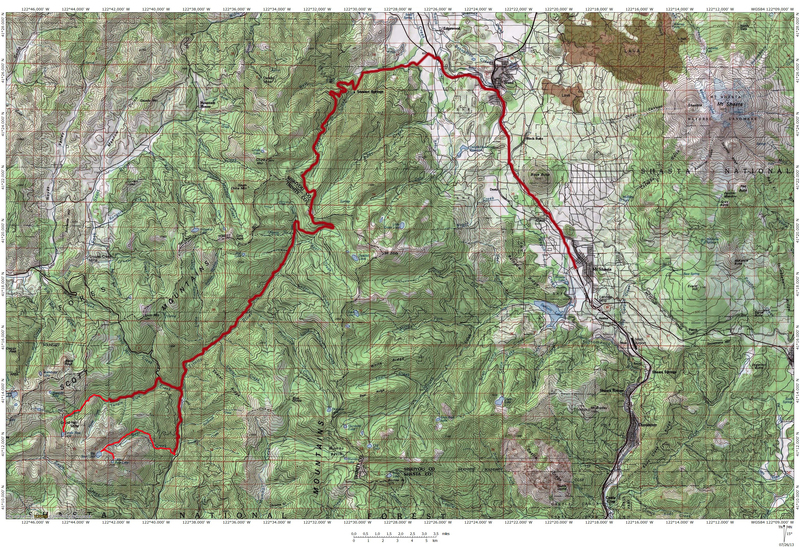 The Trinities boast hundreds of miles of trail, all of which are scenic and are usually spectacular. Unfortunately, it is the very vastness of the Trinity Alps that makes them a difficult place for day hikers to explore. Most of the best trails require an overnight trip or longer in order to reach the destination, let alone have the time to appreciate it. The Trinity River, on the drive from Mount Shasta. Fortunately, the two trails closest to Mount Shasta are easily done as day hikes, though they make good overnight destinations too. Of all the many trails in the Trinity Alps, the Bear Lakes and Tangle Blue Lake Trails are the most easily accessed from Mount Shasta. 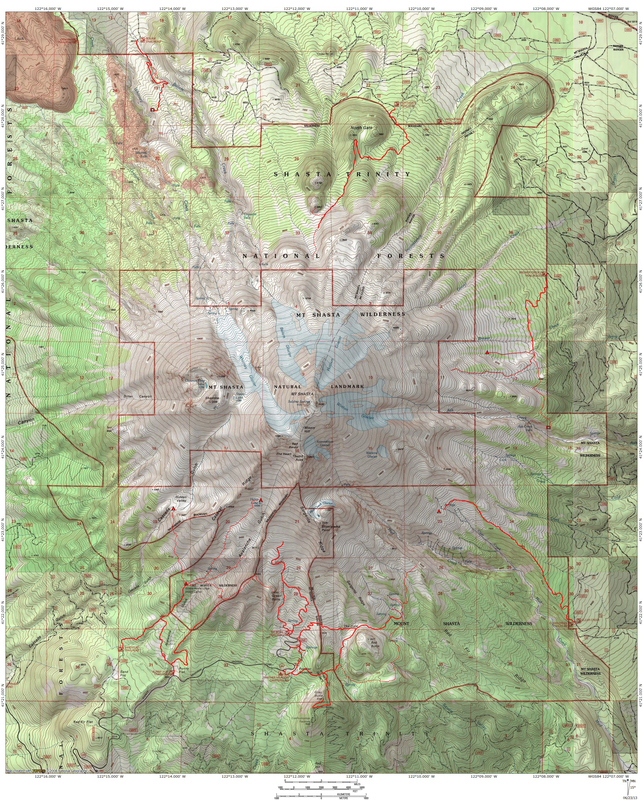 The trailheads for both trails are only a one hour drive from Mount Shasta City. For comparison, it takes about an hour to reach the Clear Creek and Brewer Creek trailheads on the east side of Mount Shasta. Both of those require miles of driving on dirt roads. In contrast, the Bear Lake Trail is possibly the most accessible of all Trinity Alps trailheads, with only a few hundred yards of dirt road. The Tangle Blue Lake Trail only requires 3.5 miles dirt road. 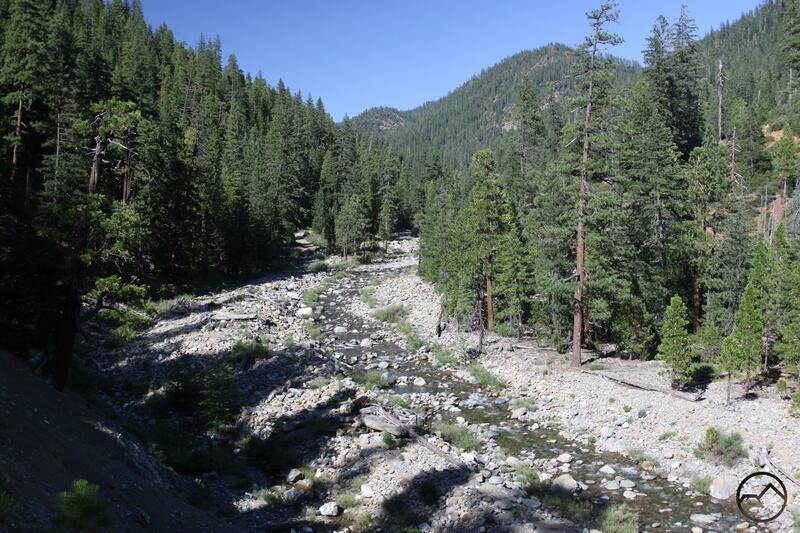 The drive itself is incredibly scenic, climbing over Parks Creek Pass by Mount Eddy, where amazing views of the Trinity Alps unfold to the west, before following the Trinity River from its headwaters all the way down to where the river meets Highway 3. It is so scenic that the drive is worth doing for its own sake and boasts numerous hiking and camping opportunities along the way. Mount Shasta viewed from the Bear Lakes Basin. The trails themselves lead to premier destinations. 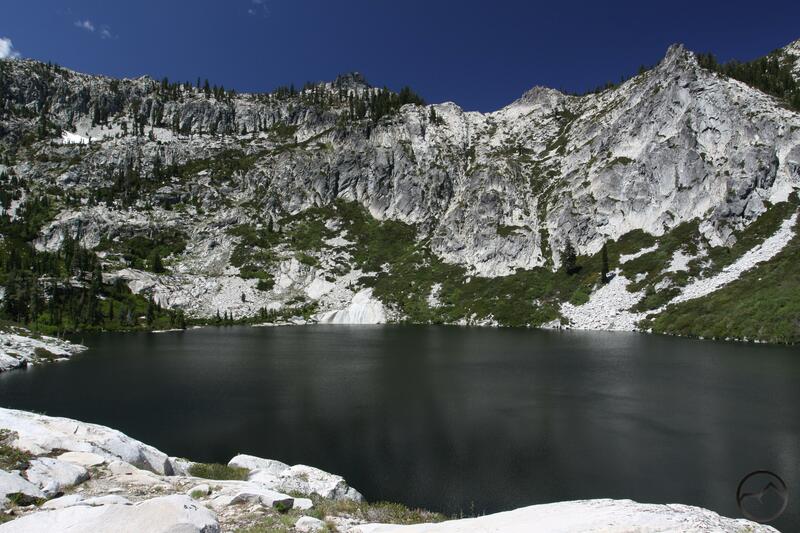 The Bear Lakes Trail is the grander of the two, leading to a massive granite basin. Two cirques are tucked away at the back end of the basin, each containing a lake. 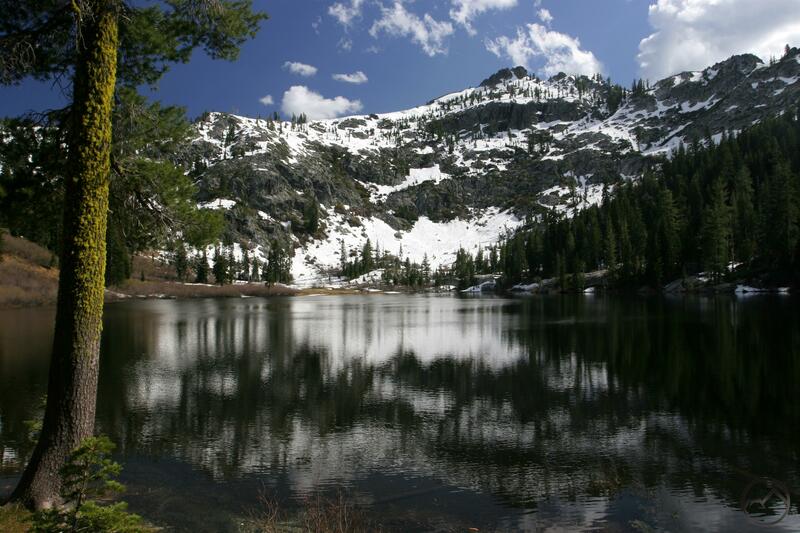 Big Bear Lake is one of the largest in the Trinity Alps. Though smaller, Little Bear Lake may exceed its larger sibling is scenic qualities. Just below Big Bear Lake is a large series of open, granite slabs over which tumbles Bear Creek in a series of refreshing cascades. 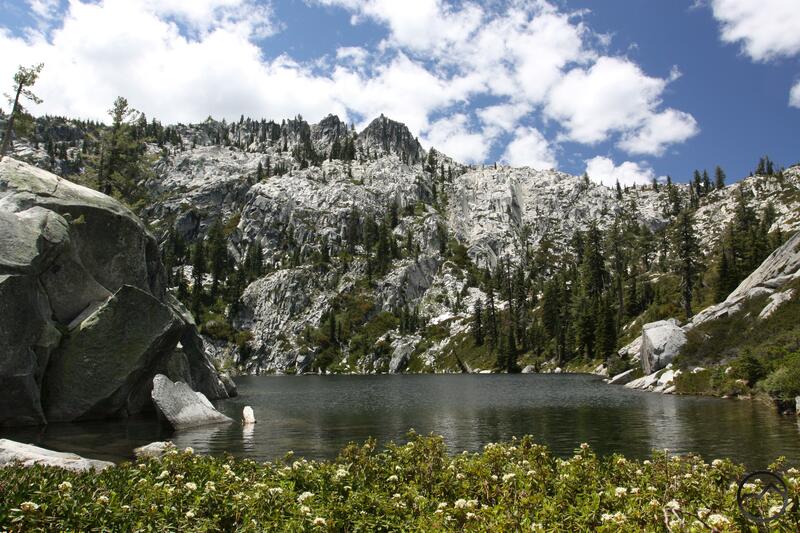 Like much of the Trinity Alps, the whole area is very reminiscent of the granite terrain in the Sierra Nevada. Tangle Blue Lake is a bit more subdued but is exceptionally scenic nonetheless. Rather than the stark beauty of the granite cliffs and large, deep lakes, the Tangle Blue area is filled with refreshing meadows and springs. Large granite cliffs are still present, especially at the south end of the lake, but it is complimentary to the lake, rather than the massive cliffs at the Bear Lakes, which tend to overpower the scene. Of course, the trail into Tangle Blue Lake is shorter and easier, so one does not have to work as hard in getting there. Either way, both lakes are classic Trinity Alps lakes and make great day trips from Mount Shasta. Alone among the trails in the Trinity Alps, the Bear Lake Trail travels alongside the main branch of the Trinity River. From the trailhead, the path loops down to the river and crosses over Bear Creek before climbing up the gully on the far side of the creek. From there the trail makes a few swithbacks and begins a steady ascent up the Bear Creek drainage, running parallel to the creek for a mile. After crossing a bridge over the creek near some pretty waterfalls, the trail begins a long series of switchbacks up a ridge that runs between Bear Creek and an unnamed tributary. Eventually the trail straightens out and continues to follow Bear Creek again. After crossing some clearings caused by avalanches and passing through some small meadows clinging to the side of the canyon, the route emerges into the open granite basin that contains Big Bear Lake. 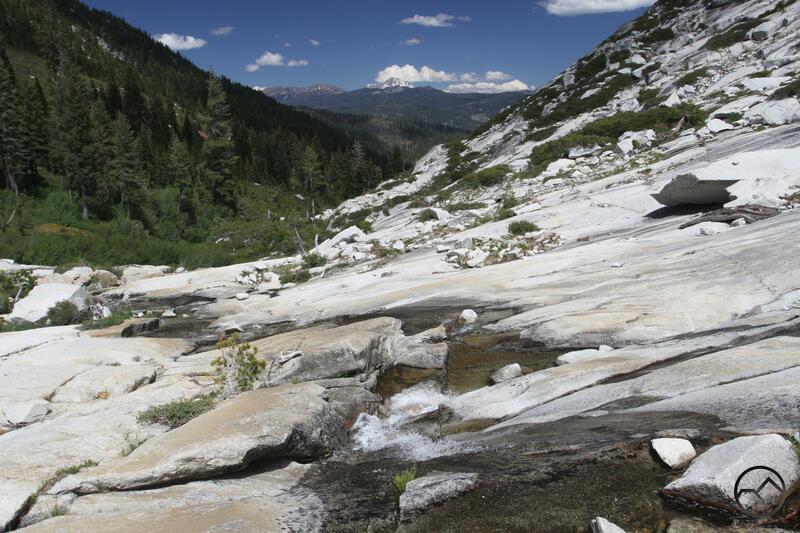 Alongside the trail, the creek cascades over open, granite slabs. Mount Shasta looms far to the east. The path finally ends near the creek’s outlet at the east end of Big Bear Lake. The 1,300 foot granite cliffs surrounding the lake are magnificent. Returning to the slabs, a cross-country route leads to lovely Little Bear Lake and the underappreciated Wee Bear Lake. Both are worthy of the effort to reach them. The hike to Tangle Blue Lake stays in close proximity to Tangle Blue Creek for the duration of the hike into the lake. The first portion of the hike follows an old road with numerous opportunities to scramble down to the creek and enjoy the cool, clear water. Eventually the road fades out and the route becomes single track. After passing a small meadow the trail crosses the creek and makes a gradual climb uphill to a crossing of Marshy Creek, which originates in Big Marshy Lake, located 1,000 feet higher up the canyon wall from where the trail is. Beyond the crossing the Tangle Blue Lake Trail enters a large, lovely meadow where the granite towers above the lake become visible for the first time. After crossing the creek again, a short, final climb leads to another meadow and Tangle Blue Lake. Granite cliffs form an inspiring backdrop behind the lake, which is ringed with verdant meadows. The driving route from Mount Shasta to the trailheads for the Bear Lakes and Tangle Blue Lake Trails.